There are 1.4 million miles of gravel and dirt roads in the United States. that's about one third of all roads in the country. You can ride just about any kind of bike on gravel, but models made just for rough surfaces have room for wider tires (a), a relaxed head-tube angle for more predictable steering (b), and a long wheelbase and low bottom bracket for calmer handling (c). 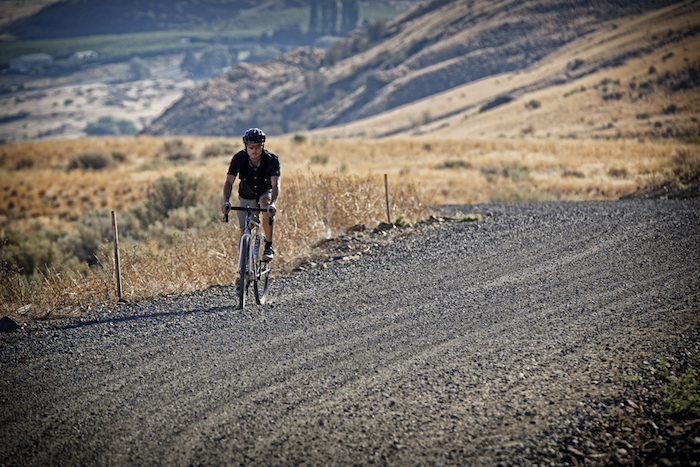 Check out our gravel-gobbling Haanjo and Haanjenn series. Staying in the saddle keeps your weight centered, which means more traction for your rear wheel. On steep or washed-out grades, shift to a low gear and spin with a high cadence (around 90rpm). Wider Tires offer better Traction and a softer ride--go as fat as your frame allows. Ryan suggests running the max air pressure recommended on the tire to reduce your chance of pinch flatting, about 90 to 100 psi for most riders.